Large-scale map series of Central and East European countries are among the most frequently consulted maps in the collections because of their value to genealogists attempting to locate the names of towns from which their ancestors emigrated. The Karte des Deutschen Reiches , for example, consists of 674 separate map sheets. Most of these sheets were revised one or more times resulting in a total count of 4,074 map sheets covering the period from 1879 to 1944. Printed at a scale of 1:100,000 by the German mapping organization Riechsamt für Landesaufnahme, this series provides geographic coverage for pre-World War II Germany, which included parts of present-day Poland and Russia. Maps and atlases were among the first items acquired when the Library of Congress was established in 1800. It was not until 1897, however, when the Library of Congress moved into its own building, that a separate Hall of Maps and Charts was created to house the growing collection of 47,000 maps and 1,200 atlases. The division now occupies an area of 90,000 square feet in the Library's James Madison Memorial Building. 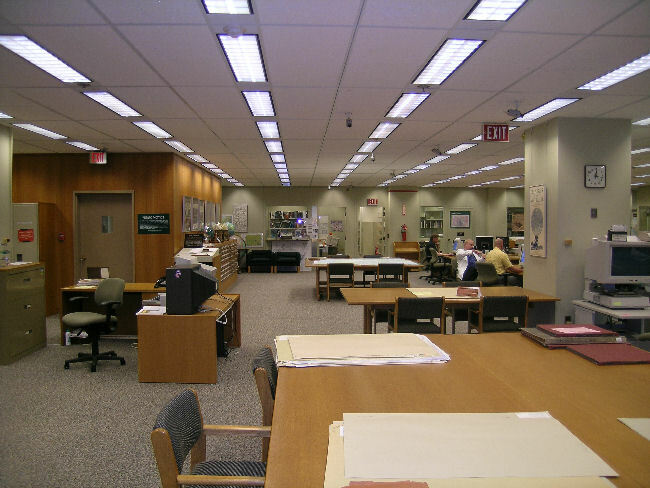 The area is specifically designed and constructed to accommodate a variety of cartographic collections, library functions, and a professional and technical staff of 38 persons. Annual additions to the Geography and Map Division's collections average 60,000-80,000 maps and 2,000 atlases. Because surveying and mapping are significant government functions and responsibilities, approximately 60 percent of the maps and 20 percent of the atlases are received from official sources. Most private and commercial cartographic works published in the United States are acquired through Copyright or through purchase. Many rare and valuable maps and atlases in the collections have been presented to the division by generous and public-minded citizens. The Geography and Map Division of the Library of Congress provides cartographic and geographic information for all parts of the world to the Congress, Federal agencies, state and local governments, the scholarly community, and to the general public. It is the largest and most comprehensive cartographic collection in the world, numbering over 5.2 million maps, including 80,000 atlases, 6,000 reference works, numerous globes and three-dimensional plastic relief models, and a large number of cartographic materials in other formats, including electronic. Among the earliest original maps in the collections are three manuscript portolan atlases and 19 portolan charts from the fourteenth through seventeenth centuries drawn on vellum by Italian, Portuguese, and Spanish cartographers. The excellent collection of atlases dates from an 1482 printed edition of Claudius Ptolemy's Geography and includes representative volumes of all significant publishers of atlases for the last five centuries. The atlases cover individual continents, countries, cities, and other geographic regions, as well as the world ranging in scope from general to topical. Of particular interest to genealogists and local historians is a large collection of U.S. county and state maps and atlases published in the nineteenth and early twentieth centuries. Atlases published during the past four or five decades and covering national, regional, state, and provincial resources form another noteworthy reference group. The division has an excellent collection of manuscript and printed maps of colonial America, the Revolutionary War, the War of 1812, the Civil War, and the wars of the twentieth century. Supplementing these historical records are photo-reproductions of manuscript maps from various American and European archives. The Hummel and Warner collection inlcude rare manuscript and printed maps and atlases of China, Japan, and Korea from the seventeenth century. About 55 percent of the maps are individual sheets of large- and medium-scale map series and nautical and aeronautical charts published during the nineteenth and twentieth centuries. Official topographic, geologic, soil, mineral, and resource maps and nautical and aeronautical charts are available for most countries of the world. The collection of single maps embraces more than two million general and special subject maps of the world and its various political entities, divisions, and subdivisions, with maps of the Americas and countries of the Western Hemisphere predominating. North America, the United States, each of the 50 states, and the largest cities are especially well represented. Among the numerous county maps and city and town plans are some 700,000 large-scale Sanborn fire insurance maps, in bound and loose sheet volumes. The Sanborn Map Company was the dominant American publisher of fire insurance maps and atlases for over 100 years. Founded in 1867, the firm has issued and periodically updated detailed plans of 12,000 American cities and towns. Some areas are represented by as many as eight different editions. This collection constitutes an unrivaled cartographic and historic record of America's urban settlement and growth over more that a century. For more information on the Library of Congress' Geography and Map Reading Room, visit www.loc.gov/rr/geogmap/gmpage.html.